A grenade explosion inside a packed private operated passenger bus at a location in Kahagolla, Diyathalawa early Wednesday that left 19 persons injured, some critically, has prompted some eerie questions with little or no answers. At the centre of the bloodied incident is a Staff Sgt. who is alleged to have been in possession of the grenade when it went off prematurely sending shrapnel flying throughout the vehicle and injuring almost every occupant. The Sergeant is currently in Intensive Care fighting for his life at the Diyatalawa Hospital along with several more of the injured who are being treated at different facilities. According to the senior officer in charge of the investigations close to the scene, the suspect soldier was heading for duty after home leave which has led to confusion on the motive for his behaviour. 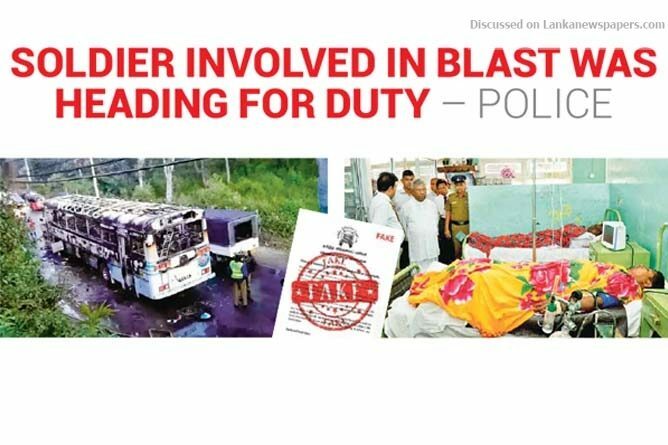 “It is strange for this particular officer to be transporting an explosive of this nature in his possession prior to reporting for duty simply owing to the risk factors involved,” says Bandarawela Police Superintendent (SP) Sudath Marasinghe. He says there is very little to go on from here since the suspect is in a critical condition and is unable to provide a statement to investigators which would be helpful in the probe. “However, we have recorded statements of 25 others including fellow passengers, the crew and the suspect’s immediate seniors among others,” adds SP Marasinghe. The military for their part are holding a separate inquiry and towards this end it has appointed a high-level six-member team headed by a Major General to carry out a thorough probe and conclude a report with recommendations at the very earliest. Military Spokesman Brigadier Sumith Attapattu said that strict security arrangements will be enhanced in the future when service personnel are leaving a military facility for home leave. “This includes more intense checks on their person and personal luggage before they are allowed to leave the exit barrier at the military facility they are attached to. “However all this will be done once the probe is concluded and the necessary recommendations are made in the report,”Brigadier Attapattu added. However, he was also unable to say if the suspect soldier was heading for the camp or otherwise, adding that the local Police were involved in that aspect of the probe. The military have also rubbished claims of any terrorist involvement in the incident. Senior Assistant Government Analyst W.A. Roshan Fernando who visited the scene of the blast confirmed that it had been caused by a grenade explosion. Survivors later told investigators that the suspect soldier was seated between two other passengers when the grenade slipped on to the floor and exploded. They said the Sgt. Major may have attempted to conceal the grenade when he apparently lost his grip on the explosive allowing it to slip on to the floor and explode. The suspect sustained life-threatening injuries to his legs and lower parts of his body while the passengers seated closest to him sustained serious injuries to their legs. Among the injured were seven soldiers, five Air Force personnel and seven civilians, including two women. Fourteen of the injured are continuing to receive treatment at hospitals while the remaining were discharged after initial treatment, Superintendent of the Diyatalawa Hospital Dr. Ranjith Amarakone said. And while all this was happening, sections of social media poked fun at the incident sometimes bordering on frightening incidents of the past. One post had a note on a letterhead of the now defunct Liberation Tigers of Tamil Eelam (LTTE) as saying the group was responsible for the explosion in response to the behaviour of Brigadier Priyankara Fernando outside the Lankan Mission in London on 4 February. The letter went on to warn of more similar attacks against ‘war criminals’ while claiming that the North and East of the country was their traditional homeland and so on. The source of the post is currently under probe and it is currently being treated as a piece of mischievous ‘fake news’.